The following is an editorial from Kalvos & Damian's New Music Bazaar. It does not represent the official opinion of WGDR or its licensee, the Goddard College Corporation. As some of you know, Kalvos & Damian's home station WGDR FM 91.1 is in turmoil, both internally and in its relationship to its licensee, the Goddard College Corporation. In the personae of Kalvos & Damian, we have never taken a position on these issues. Our topic is new nonpop, and the associated arts, literature, and humor. We have strong opinions about music and the arts, and have presented both awards of good news and awards of ignominy. We are not afraid to speak our minds about issues that affect progress in the musical arts; only two weeks ago we presented our fifth annual Golden Bruce Award to the Copyright Arbitration Royalty Panel. In the background, too, we work for new nonpop, creating public concerts and performance opportunities such as our Ought-One Festival and next year's ZipThree NonPop Festival. But the present situation at WGDR puts Kalvos & Damian in jeopardy as both a community broadcast and worldwide on-line resource, and puts tiny WGDR in a situation out of which it may not recover its footing, psychologically if no other way. As producers, we are involved in the debate off the air. Now, as Kalvos and Damian, we have been drawn involuntarily into the debate on the air. We understand next week's Kalvos & Damian show will be pre-empted for Goddard College business. We were neither consulted nor informed of this; we learned third-hand about the pre-emption -- which cancels our long-awaited interview with the world-renowned composer and trombonist George Lewis. We don't object to being pre-empted for such an important program. We do mind not being consulted or asked or even told, because it bodes ill once more for a management that cannot bring itself to respect its community programmers, merely because it has the license to do so. During seven full years of Kalvos & Damian, through numerous difficult issues, we have only been positive about WGDR and protective of Goddard College, which has always been relieved of bearing responsibility for the controversies we create here on the Bazaar. Our support of the station's licensee has never been reciprocal. Through 365 continuous shows, no member of Goddard College's administration has ever stopped in with good wishes, or even called us or written a note to say congratulations for the national awards and reviews that have brought esteem to this college from two unpaid community volunteers. Kalvos & Damian's New Music Bazaar has sought to provide debate and expression and feedback on issues of new nonpop and the musical arts. We expect to continue to do so on the air at WGDR, and we plan to be here for you every Saturday afternoon (except for next week, of course) -- unless the door is closed to us, as it will be next week. Yes, we will continue on-line indefinitely at kalvos.org, but our mission, which began with the local community, is given extra and continuing meaning because of that community. So we call on, we expect, this station's licensee to work on overcoming its behavior of community neglect and disrespect. WGDR is an educational, community radio station from the campus of Goddard College providing non-commercial broadcasting resources for students, staff, faculty and community members of the central Vermont area. The goal of the station is to enhance individual exploration and creativity within a free-format design of volunteer programming. The purpose of this free format design is to better inform and interact with the listening community of the station's service area. Complementing this format, the station seeks to encourage community participation, critical feedback, lively debate, and local expressions on all issues brought forward for discussion and examination through the station's programs. 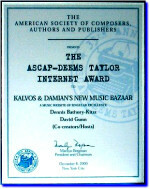 The preceding was an editorial from Kalvos & Damian's New Music Bazaar. It did not represent the official opinion of WGDR or its licensee, the Goddard College Corporation.